When, Where and Why Do Monarchs Form Roosts? Migrating monarchs rest at overnight roosts at the end of the day. Imagine finding a roost in your hometown, with hundreds or thousands of butterflies! How might roosting help monarchs survive the migration? Read the selected observations below and look for clues. Or, read current observations in the database and/or by clicking on the map. 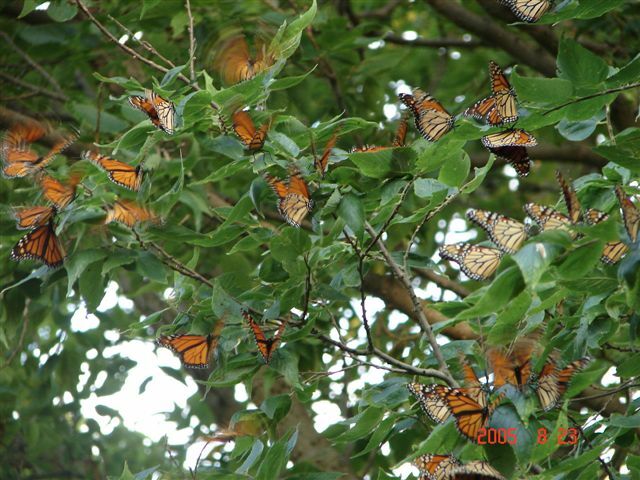 When & where did people find roosting monarchs? What might these observations tell us? 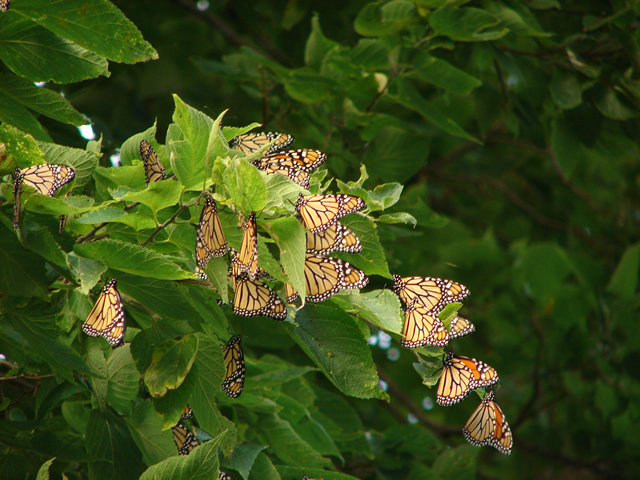 A number of small clusters of roosting monarchs as well as many individuals in the trees overlooking Oakville Harbour, on the NW shore of Lake Ontario. The town has many plantings of Butterfly bush here. There were some still nectaring. This was AMAZING! There had to be thousands of Monarchs roosting along an alfalfa field. The field also has clover. The roost extended along about a 1/2 mile grove of trees. Some of the trees were box elder but most were maybe 40-50 foot tall choke-cherry trees.. At first we thought thre were hundreds--but the roost went on, and on, and on--with hundreds in each tree. How beautiful. They were all on the south side of the trees. Little wind- maybe 10-15 miles or so. We're seeing hundreds clustering in a few familiar sites in the Sioux Falls/Harrisburg, SD area. We are finally seeing numbers of migratory monarchs again here in eastern South Dakota. Our "drought" of the last two years is apparently over. In the last two days we tagged nearly 600! We aren't getting the calls in town like we used to (West Nile spraying? ), but nearby towns and rural areas are calling and it's like the old days when you could easily get 20 or more in a single sweep of the net! Approximately 60 monarchs are roosting in our grove. Tagged 25. Many appear young, fresh color and wings. I live in the country outside of city limits. I discovered hundreds of monarchs randomly flying and choosing a roost for the night in my grove of trees (ash, maple, & Black Hills Spruce). Weather facts for the day: Sunrise 6:49am Sunset 8:05 pm Low temp 53 High temp 84; 0 precipitation, Wind north. I have never seen so many on the property before. I do have a large flower garden. Could that be the attraction? They remain on the property this morning - randomly flying. Observed one small group of monarchs roosting in a young ash tree's branches. There were 60 to 70 monarchs roosting at dusk with a few more straggling in out of the northeast. All of these migrants were roosting together on the same branches and the east side of the tree. This tree was in the midst of many large pines and located adjacent to the same nectar-laden field where my kids had been netting and tagging earlier that weekend. We have had high temps in the 70's and lows at night in the upper 50s. I sighted over 100 and possibly more monarchs in our trees. We have many trees on our property and noticed them 2 days ago (8/26/05). As of tonight they were still here. I don't know their flight path and if they have been here before. We have lived here for sometime now and haven't noticed them before. I was so excited about it that I wanted to learn more about what they really are doing. For the past few days we have observed thousands of monarch butterflies in our windbreak and grove. Approximately 40 monarchs spotted in small roostings on oak and birch trees this morning. It was raining heavily when I checked on them at 6am. Each group had chosen branches well protected by the canopy, and some distance into the woods rather than on the perimeter of the yard where I usually find them. Very exciting monarch year. Largest numbers at my location in many years. We’re seeing strong, tight roosts on 08/21 through 08/24. Each night it was 55°f or lower. It seems 55°f and lower really encourage the concentrated roosts. Each day there are thousands nectaring on the flowers. On the warmer nights they roost in the trees as singles or groups of 5 or less. I've been experimenting with finding roosts. I have found several by looking for overgrown fields or ditches with many flowers blooming. I then look for the nearest groups of trees. I return in the evening or early morning. So far I have had success at 4 out of 5 locations. I think the key to finding roosts is finding the nectar source. Even when migrating hard monarchs seem to stop for a sip. I have had a lot of butterflies in my yard the last few nights. Last night (8/23/05) I had about 550 roosting in the trees surrounding my house. Tonight (8/24/05) there were about 900. I have been keeping track of the number in my yard each night (except when I'm out-of-town) from about August 15 to Sept 20 for the last several years. Here is the number of butterflies roosting in my yard from Aug. 15 to Aug. 24 from 2001 to this year. The Monarch population has certainly rebounded in my area. So far they don't seem very interesting in heading south (even on calm nights or North wind they are clustering in my yard). I expect that as soon as the wind comes out of the north again they will be off towards Mexico. It is sure fun to see numbers of butterflies again. We first noticed monarch butterflies on Tuesday, 8/23/05 and they are gone this morning (Saturday, 8/26/05). We had rain and cooler weather last night. There were hundreds of butterflies in our shelter belt. They stayed in one area and always returned to the same trees. Ontario butterfly enthusiast John Powers reported tonight that he visited a 5 acre field of alfalfa and clover near Cambridge, Ontario - about one hour west of Toronto. John estimated that there were approximately 2,000 adult monarchs nectaring in this field. At the south side of this field was a row of pine trees, upon which the monarchs were roosting as the day ended. I see the Monarchs here every summer at this time, clinging from the trees. Today I saw up to 22 butterflies per branch. This location is relatively high, on a hill over a river valley. They show up on the maple trees more than the others. 20-30 monarchs are nectaring on Rough Blazing Star (Liatris aspera) during the day, and roosting at night on Bur oak and maple trees.